The current issue of Woodsmith (No. 127) features a drawer with a hidden compartment that's built into the back of the drawer. But there's more than one way to do this. In fact, adding a hidden compartment is a lot easier than you might think. A while back when I was working on some pigeon hole dividers for a desk, I added a simple hidden compartment behind one of the drawers, see photo. 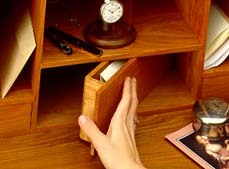 This hidden compartment (really just a "stubby" drawer) fits the opening exactly, so you can't see any gaps around the edges. This way, when the compartment is in place, it looks like the back panel of the desk. To open the compartment, you have to know exactly where to push. The "sweet spots" are at the sides. Push either one, and the opposite side pivots forward so you can pull the compartment out, see Fig. 1. First of all, this won't work in every situation. If the bottom of the drawer opening isn't solid (as it was in my case), there should at least be rails below the drawer that are wide enough to support the hidden compartment. And when building the compartment, it's best to start with the front piece, see Fig. 2. When it fits perfectly, build the sides and back. Also, the compartment pivots open easiest when the back corners are slightly rounded.